This Mother’s Day, show your mom how much you appreciate her by making mothering easier for another deserving mom. Sure, you could buy her flowers, but empowering another mom just might say so much more. And just might say it so much louder. 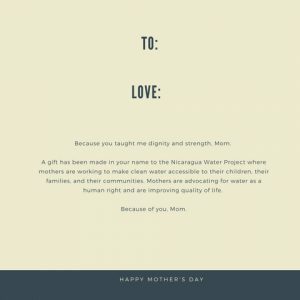 Empower mothers in Nicaragua by supporting projects that are supporting women. Donate, download, print, and send!